All natural, herbal remedies need not be expensive or hard to make. With a few basic tools and ingredients and the right instructions, you can easily make fresh, effective preparations at home that you'll feel good about. Remember that many medicinal plants can also be eaten! 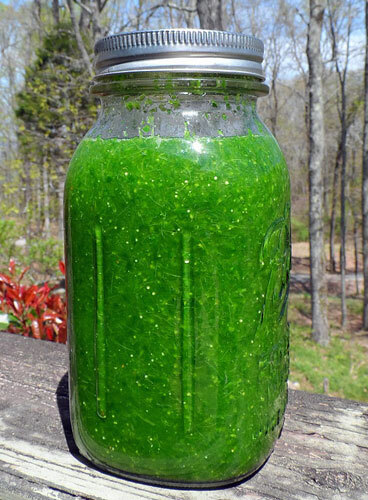 Herbs can prevent sickness as well as assist with illness if they are used in the daily diet. Many plants require an extraction method to draw out their active constituents. This is where preparations are invaluable. The methods are not as difficult as they may sound. Remember to never use aluminum ware when preparing any herbal medicine because aluminum can react with the chemicals in the herb and affect the end product. It is also known to accumulate in the body over time and has been implicated in Alzheimer’s disease. Use stainless steel, Pyrex, earthenware, or enamel, free from chips and cracks. Safety first! Only buy herbs from trusted, reputable, reliable sources, and always check botanical plant names to be sure you are buying or harvesting the correct plant material. Many different plants share the same common names. Start with simples, or one herb at a time, before trying herbal combinations. This makes it much easier to eliminate herbs you might be sensitive to. It will be very difficult to pinpoint an allergy from a tea containing five different herbs. Do your homework and make intelligent, informed choices. Organic is best. If you are wildcrafting, remember this: Never harvest from roadsides where plants have been contaminated by vehicle exhaust and road maintenance weed killers, and harvest ethically by never taking all of one plant species from any location. Leave some for Mother Nature and for others. Whether for health or simple pleasure, herbal teas are gentle, soothing, beneficial, and enjoyable any time of day. They are also a wonderful substitute for caffeinated colas and coffee. Mix flavors and have fun creating your own blend. Pour water over herbs (easily prepared in a glass quart jar) and cover securely. Steep for 4 - 10 hours then strain and drink. Sweeten if needed. A poultice is an effective way of applying herbs directly to the skin. 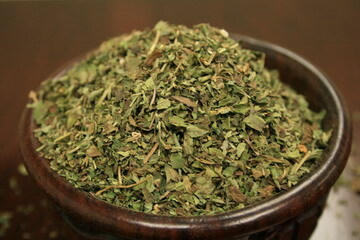 The fresh leaves can be bruised and mashed, or powdered or dried herbs can be used. Pour over just enough boiling water to wet the mixture. Ground linseed, white bread, or bran can be added to give the poultice bulk and help retain the warmth. Apply the mixture wrapped in a cloth (cheesecloth, old cotton sheet sections, etc.) over the area and cover with another hot, wet cloth. Replace the cloth with another when it cools. Repeat this process keeping the poultice hot. 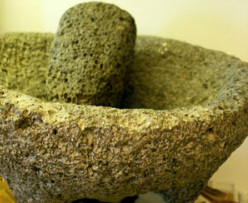 Poultices are useful for drawing inflammation to the surface or easing painful joints. Wash the poulticed area with chamomile infusion to ease any inflammation. Tinctures extract the chemical constituents in alcohol, cider vinegar (white vinegar is synthetic and defeats the purpose, we think), or vegetable glycerin. Alcohol is most effective and therefore the most commonly used. Vinegar or vegetable glycerin can be used where there is a reason not to use alcohol, such as for small children or alcoholics. Tinctures are invaluable, as water will retrieve only some of the medicinal properties. You can certainly use 90% or higher alcohol for any tincture, but to save money, it pays to research the required alcohol concentration for each herb. For example, garlic requires only 25% alcohol, while Chaste Tree berries require 75%. 100 proof (50% alcohol) vodka is a popular all-purpose solvent for tinctures. 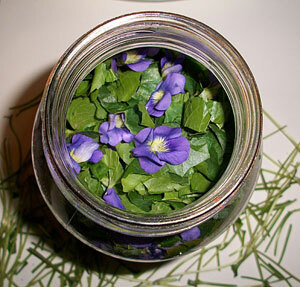 Ask us if you are interested in Red Barn Herb Farm's tincturing methods. 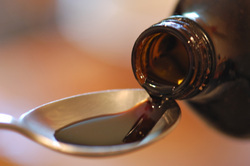 Syrups are very useful for cough mixtures. This is a useful method of applying herbs topically. The herb is held in suspension and a certain amount of absorption of active constituents occurs through the skin. The ingredients making up the bulk of the ointment can also have therapeutic value. For example, beeswax has natural antibacterial properties. There are many, many different ways to make an effective salve. Experiment to find what you like best. Slowly heat oil over a pot of hot water or in a double boiler over med-low to low heat. Add herbs and heat gently for ½ to ¾ of an hour. Do not allow the oil to boil; it can cause your infusion to lose important healing properties. (If you do allow it to boil, carefully discard the oil and start over.) Strain through muslin or cheesecloth, squeezing the herb to extract all the oil, being careful not to burn yourself. Add the beeswax, varying the amount depending on how firm the final ointment needs to be, and stir gently until the wax is melted. Pour into sterile, labeled jars and cool before putting on the lid. Note: Tinctures or essential oils can be used instead of the fresh or dried herbs. Use 1 ½ t of tincture or oil to 4 oz of oil, stir before pouring tincture into sterile jars, so the tincture does not settle on the bottom. 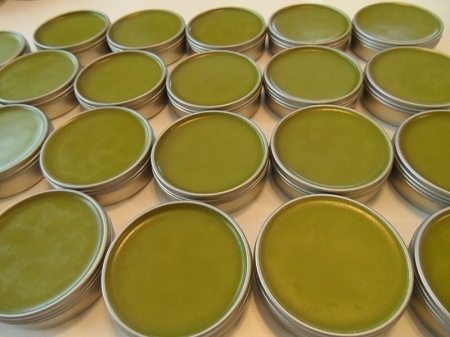 *You may also use 1 oz of beeswax per 1 cup of infused oil for a smaller batch of salve. Don't let any of the recipes daunt you; they are much easier than they look. You'll be surprised how much fun it is to make your own remedies, and practice makes perfect! Disclaimer: This information is provided for educational purposes only. We are not responsible for any accidents, miscalculations, or other mishaps whatsoever that may occur from your own herbal preparations. Be safe!